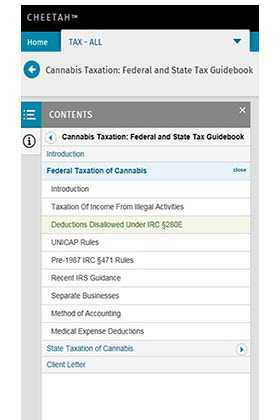 Cannabis Taxation: Federal and State Tax Guidebook addresses both federal and state tax guidance on the taxation of marijuana, cannabis, or related products. The publication provides an overview of federal taxation policies related to cannabis, specifically Code Sec. 280E, the interplay between Code Sec. 280E and other code sections, and any legal issues therein related. The bulk of the publication is a state-by-state survey of how marijuana or cannabis is taxed and how manufacturers, distributors and retailers of cannabis are taxed differently.